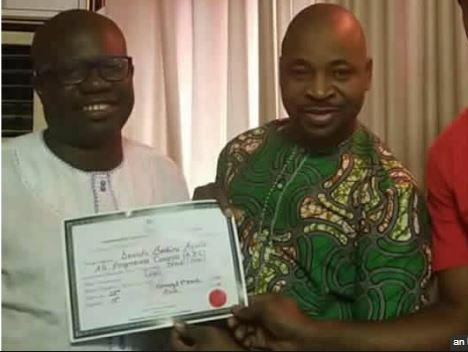 According to a report by Punch Metro, Dr. Bashiru Dawodu, the winner of the Oshodi/Isolo Federal Constituency 1 election, has presented his Certificate of Return to the National Union of Road Transport Workers, Musiliu Akinsanya, aka MC Oluomo. The Certificate of Return was issued by the Independent National Electoral Commission to candidates elected on the strength of general elections in the country. Dawodu, who is a member of the All Progressives Congress, visited Oluomo’s home and thanked the NURTW leader for the role he played in his victory. In his response, Oluomo said he would support Dawodu to become a senator in 2023 by God’s grace. Dawodu is a paediatrician once based in Camilla, Georgia, United States of America. He received his medical degree from the University of Lagos College of Medicine and had been in practice for more than 20 years. According to his citation as published on health.usnews.com, Dawodu was one of two doctors at Mitchell County Hospital and one of 183 at Northside Hospital-Forsyth who specialised in Paediatrics. As a House of Reps aspirant in 2018, Dawodu, in collaboration with a U.S. group, Eko Club Atlanta, held a two-day free medical checkup for residents, commuters, traders and businessmen/women in Oshodi community. About 4,500 persons were reached through the free medical service, The Nation newspaper had reported.